The Garden has many sites available to fit your event. These are only a few of our amenities, so a private tour is the best way for you to get the full experience. The Garden is yours to explore with one of our private guides. 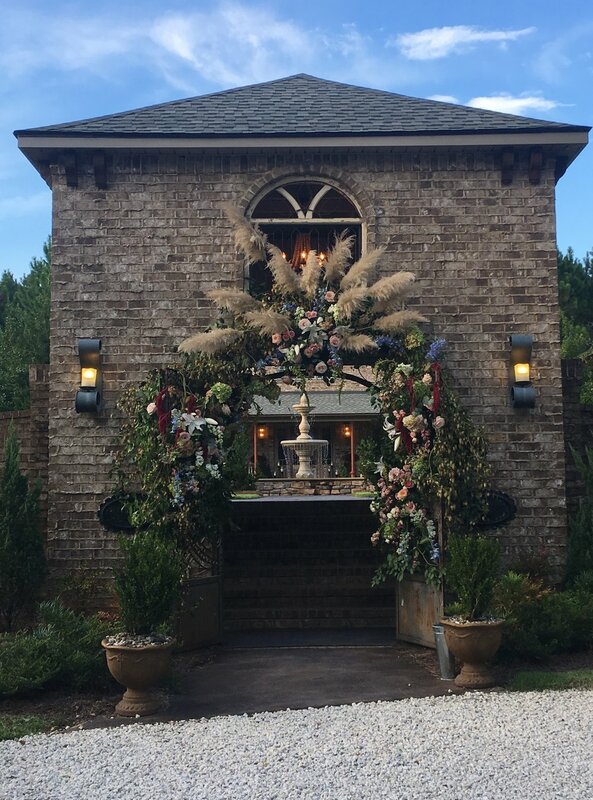 The open air chapel features stunning antique doors and windows that have been hand selected from all over the world and brought here, to Loxley, AL. This breathtaking setting pales only to the gorgeous brides that walk through the high arch double doors. There is nothing quite like sitting in the open air, sweet smell of flowers drifting on the wind, and looking into the eyes of your forever. The main focus of The Garden is its incredible tower gated courtyard and pavilion. With 2 full service bars, fire bar, fire fountains, and waterfall fountains, it is truly a slice of paradise. Hanging bed swings and pillow covered stone benches make for the perfect lounging area for any party or wedding reception. With tall palms and swaying pompous grass, you feel transported to a private oasis. The pavilion features 6 double door entrances that can be opened to give a more airy feel. Perfect for any season, being both heated and cooled, it is versatile in utility. Weddings, receptions, dancing, first looks, and many other special moments have taken place in this area. It truly is limited only by your imagination. There is a bride and groom getting ready area within the garden, connected to the pavilion by a covered breezeway. Perfect for getting ready before the ceremony or for changing after for the reception. A full kitchen is also connected, with full catering options available. The Garden truly is an experience unto itself. The covered bridge is perfect for intimate weddings, outdoor receptions, elopements, or even that special first look. Surrounded by a forest on one side and a pond on the other, this site is one of The Garden’s most intimate spots. The tall southern pines that surround The Garden don’t just provide a private, intimate feel. They also make the perfect spot for an outdoor whimsical reception or elopement. Whether they are strung with twinkle lights or florals, this spot is truly magical. With so many gorgeous options to choose from, you may not know where to begin. The Garden at Bella Sera is here to help answer all of your questions! Get in touch with us today to learn the next steps in moving forward with your event planning process. *We are working to add details to the site, until then, please contact us for more information.